A website is the main gateway through which your target audiences get information about your business. But it is commonly seen that a lot of websites fail as far as the design parameters are concerned. If you are having a website that is inappropriately designed then it will definitely affect the search engine ranking in a negative manner. 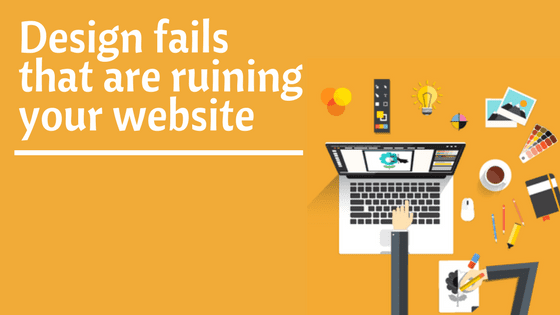 Here you will get a complete idea about the design fails that may be ruining your website. So, be ready to get some useful insight. If the font size, style, its color theme etc. are not appropriate then the website will surely lose on the design front. The usage of too many fonts should be avoided. The content should look attractive but it also needs to be readable. So, pay attention to the font style of the website. A good website is the one that is easy to navigate and all the information is readily available as and when needed. So, if the website is lacking on the usability front then one can say that it is not rightly designed. Thus it should always be the priority to improve the aspect of navigation. Many times it is seen that websites contain irrelevant information that have no relation with its main offerings. Irrelevant information is a big design failure and it will result in decreasing the customer base. So, all the irrelevant information should be skipped from the main design of the website. A website design should be responsive and if it fails on this front then it is a situation that must be corrected on time. The website should be mobile friendly, should have options to share the information on social media, there should be option for feedback submission, a separate area should be allotted for submitting the queries, if possible the live chat facility should also be embedded. These are the much needed features in 21st century. The problem of broken links or dead links is a big hindrance in website design. It can negatively affect the website functionality and the search engine ranking will deteriorate very badly. So attention should be paid to correct the problem of broken links or dead links. I usually use this tool to identify broken links on my website. It is seen that many websites contain incomplete contact details and thus the end users don’t come to know how to contact the source. It is something that should be immediately corrected as otherwise you may lose potential customers. If there will be poor quality, copied or dull images then it is a big failure on the design front. Images enhance the overall appeal of a website and thus play a great role in attracting the target audiences. Thus right images, with appropriate theme and high quality resolution should be used for your website. If you are not too fond of DIY and don’t want to hire a full time designer, look for online graphics design tools. One of my favorite tool is Canva that takes care of all of my design needs, that too for free. Sometimes the website creators are so obsessed with improving the online ranking that they overstuff the content with lots of keywords. It will create a really negative impression and the content would appear meaningless at times. Thus in order to attract more visitors, the keyword density should be optimized but not exaggerated. You must have seen many websites that use all the information on the home page itself. Such a thing is surely a design failure because the visitors will lose all the interest if they have to go through lengthy content. There should be proper sections and right information should be placed in each section. Many websites use a background soundtrack and sometimes it is so inappropriate and disturbing that the end user switches on to some other website. If a sound track is appropriate and subtle then there are no issues but irrelevant soundtracks can ruin a website. These are some of the main design fails that may be ruining your website. The other reasons for design failure can be like too many call to actions in the website, excess usage of interactive messages, inappropriate logo design, outdated content, improper placement of call to action buttons, moving sliders etc. So, keep these tips in mind and by improvising these areas the website would become drastically better.